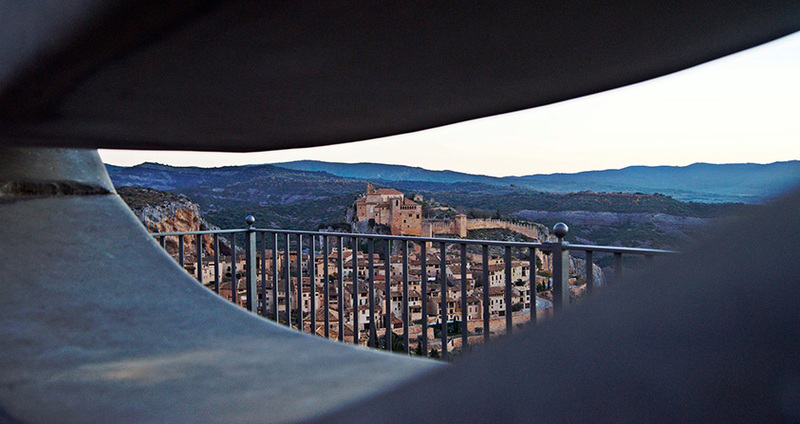 Alquezar is an up-and-coming village, as reflected by the fact that every year, more and more visitors from the most diverse countries come to visit us. A smart way to start your visit around Alquezar is by strolling along the promenade overlooking the town, by the two free car parks. As it sits on the uppermost part of the village, the views of the village are not to be missed. “The Wind Smile” is the first of a series of six contemporary art sculptures scattered around Alquezar and the only one outside the historical quarter. From here you’ll get a very picturesque view of the whole village. The awe-inspiring collegiate church perched on the rock and the traditional houses packed together beneath it form a crescent resulting from the topography and a defensive urban planning. 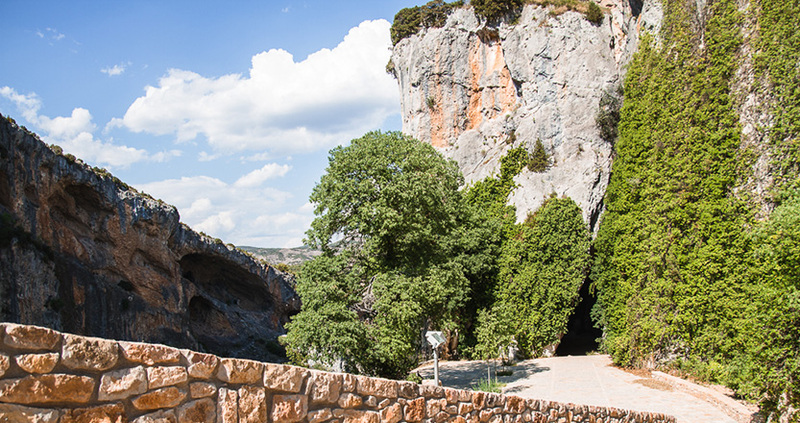 A remarkable feature is the way traditional houses were built one next to the other using stone, brick and clay, integrating seamlessly in an arid landscape of limestone and puddingstone split in two by the canyon of river Vero. THE STREETS INSIDE THE TOWN ITSELF ARE NARROW, PEDESTRIANIZED COBBLED STREETS, SO PLEASE PARK YOUR CAR IN ONE OF THE CAR PARKS NEARBY AND WALK AROUND INSTEAD. COMFY OUTDOOR FOOTWEAR IS HIGHLY RECOMMENDED. 2. The way to Nueva St.
Go on strolling around Pilaseras St while still enjoying the scenic views from here. The way winds through former olive tree terraces that have been transformed into a free car park. It goes on towards the historical quarter to the Hospital square, which has a cute fountain made of a big monolith. From here, head towards the tourist office in Nueva St, in the neighbourhood known as Arrabal. ALQUEZAR TOURIST OFFICE. OPENING TIMES: 09.30 – 14.00 AND 16.00 – 19.30 (APPROX.). DURING LOW SEASON IT’S CLOSED ON WEDNESDAYS AND THURSDAYS AND FROM JANUARY TO MARCH. In the open square in Nueva St you can find many pubs, restaurants, accommodation establishments, and some public toilets by the court wall. The vibe in high season is amazing as it acts as a kind of meeting point for our visitors from all over the world. 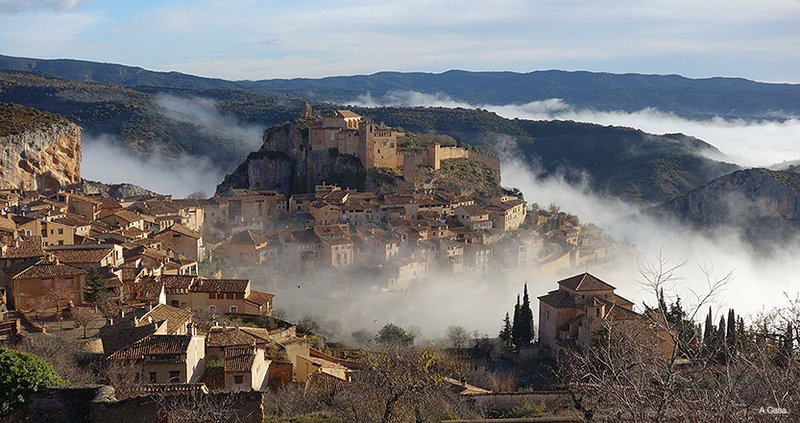 You shouldn’t leave without going under the walnut tree next to the stone cross and rediscovering a new Alquezar from a different angle, because no matter where you look at this village from, it’s always going to be a beautiful sight. From this corner of the square, a street winds down to the San Miguel Arcangel church (17th century). It’s a low-key building which appears remarkably solid and restrained from the outside, contrary to what you would imagine a Baroque building to be like. 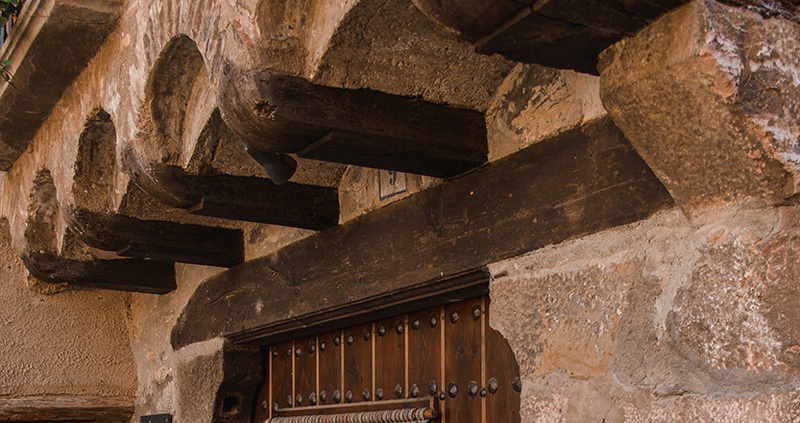 On your way back to the square, go up the street on your right instead, so that you can access the old village through a lovely gothic archway acting as a gateway to the oldest part of Alquezar. 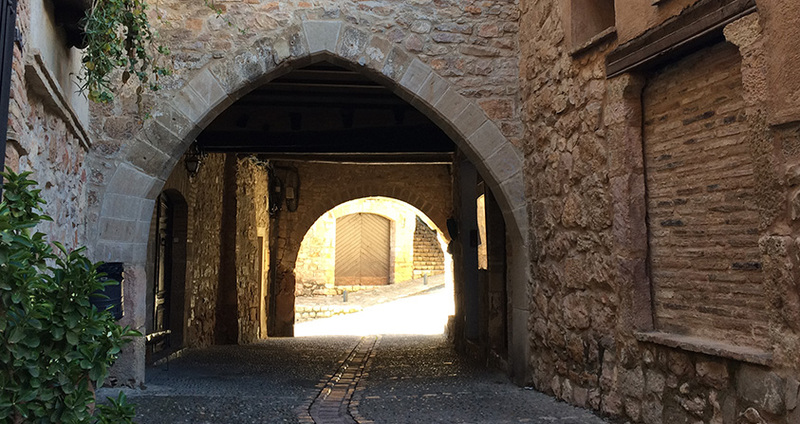 Alquezar keeps the four original entrances to the old village. The one known as The Portal is the most representative and best preserved and features the village coat of arms on top of its arch. 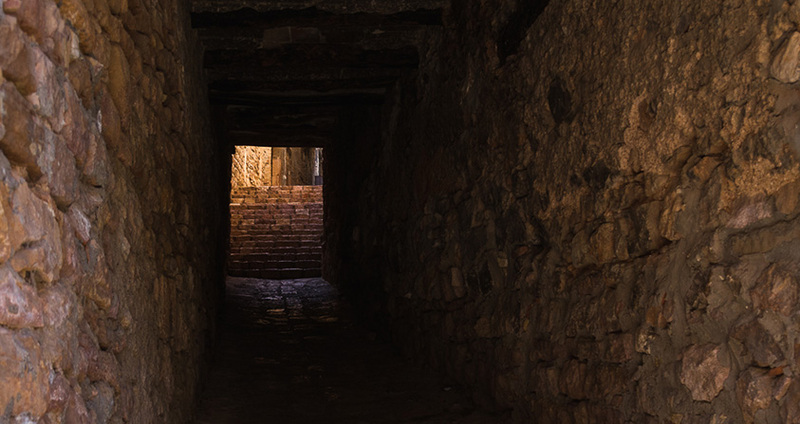 Our recommendation is to walk into the old village by this gateway as locals and visitors did for many centuries – except at night, when, at that time, gates were drawn till the next morning. Leaving behind the Portal we squeeze in Pedro Arnal Cavero St, which leads us to the main square. 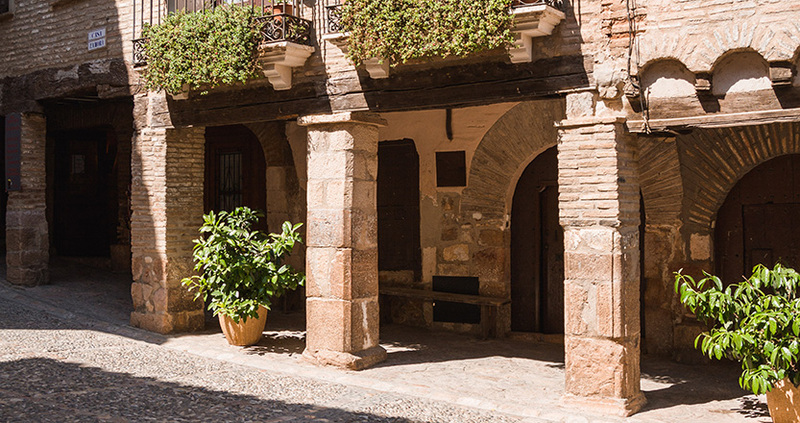 While we stroll on cobbled streets we’ll notice the diversity of building materials and systems revealed by observing the house fronts and the plethora of architectural details that integrate seamlessly within the old town. The simplicity of the stone architecture is countered by some notes of colour in the form of flowers overhanging from some windows. But it’s the heterogeneity of building materials in each house, each street, each route that makes Alquezar a really special place. 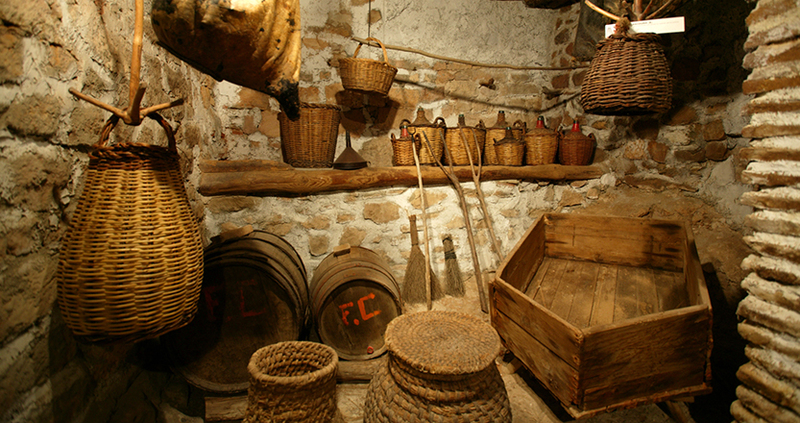 Not many things have changed over the last decades in Alquezar, apart from an increasing number of visitors who have boosted the economy of the village. 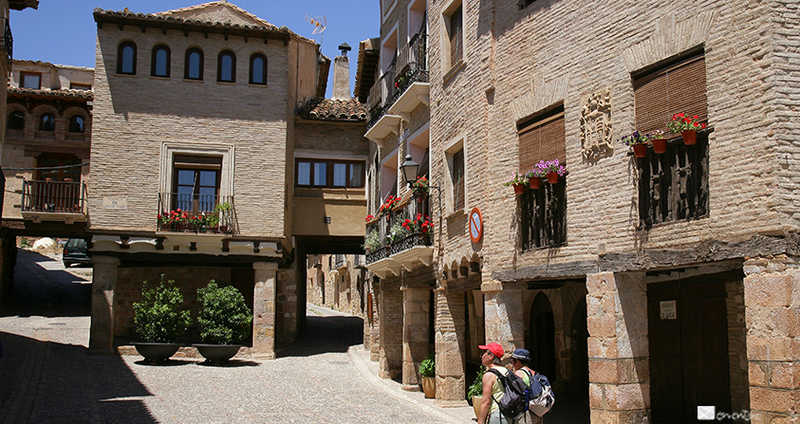 With an almost untouched medieval urban planning, there are still many ‘callizos’ in Alquezar. These are alleyways covered in many parts that house dwellers took advantage of to increase the size of their houses. 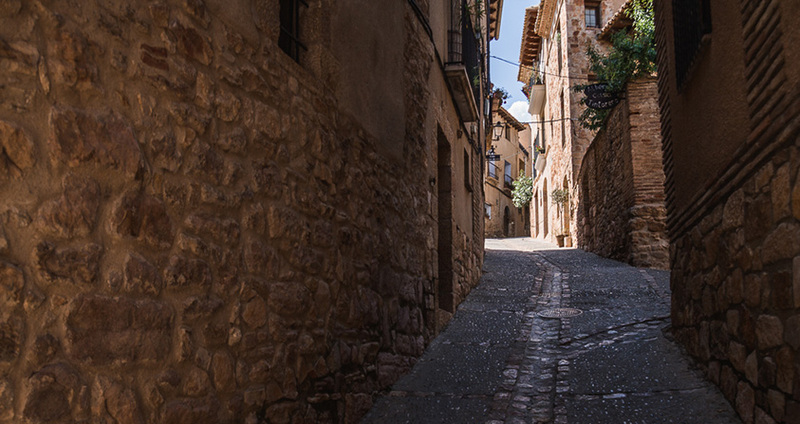 Legend has it that one could cross Alquezar from one end to the other without having to put a foot in the streets. The ‘callizo’ by the name of Gasquer along with the bricked-up arches decorating the front of Casa Naya are one of the most photographed corners in the village. 7. Shrine of Our Lady of the Snows. Just before accessing the square we’ll come across this shrine dedicated to Our Lady of the Snows. It was built using blocks of stone and has a simple façade, as it was customary back at time it was built. The humble interior is covered by nice groin vaults. 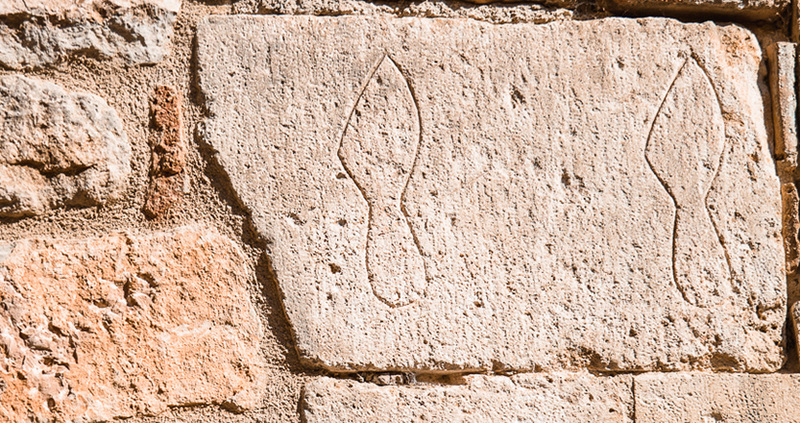 Next to the shrine, you can see the doorjamb of a covered up door, and if you pay attention, you’ll quickly notice a stone carving representing the footprints of two shoes. But what does this mean? Well, we can’t tell for sure, but most likely it was the way the local shoemaker advertised his services back in the 17th century. 8. Rafael Ayerbe square: arches and arcades. The moment we see arches and arcades we realize we’ve reached the main square. Having an irregular shape, with arcades on all its four sides and quite large, it’s surrounded by some of the oldest houses in the village. It’s an unarguably wonderful place. On days gone by the square was the village hotspot, a meeting point, a place to hang out and most importantly a commercial hub since the times of Charles V, when this Spanish emperor granted Alquezar the privilege of holding an open-air market on Thursdays as well as an annual fair. NOWADAYS TWO ANNUAL FAIRS TAKE PLACE IN ALQUEZAR: AN ARTS AND CRAFTS FAIR ON THE LAST SUNDAY IN JULY AND A LIVESTOCK MARKET IN SEPTEMBER. We’ll next leave the square by the sweetest street in Alquezar, that’s Iglesia St. At the end of the street we can make out the silhouette of the ever-present collegiate-castle. Flanked by houses, guest houses and bakeries, we’ll walk the 100 m that it takes to get to the town hall on the other end of the street. This is a several-hundred-year-old photogenic promenade perfumed by the aromas escaping from the three bakeries that make the much-relished handcrafted ‘dobladillos’. An ideal place to have a break and savour a ‘dobladillo’ is on one of the terraces or the benches along Tallada St, where you can also enjoy the views of Barranco de la Fuente, Castibián Rock and visit Mullon Cave. At the other end of this street you’ll find the entrance of the collegiate-castle. 10. The collegiate-church of Santa Maria la Mayor. We’re now facing History. 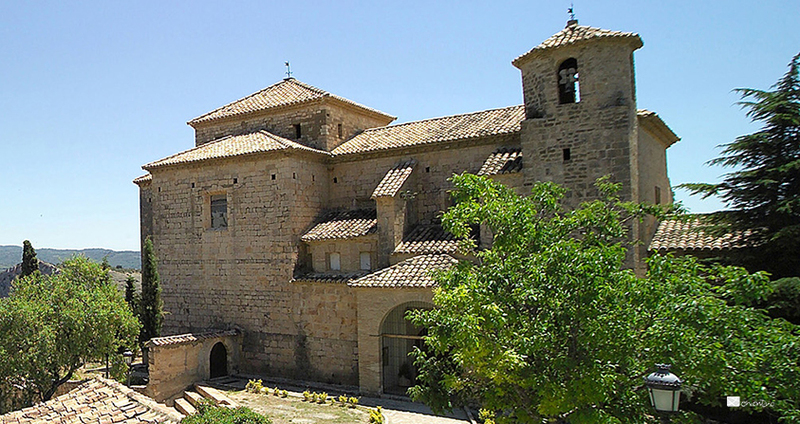 You can’t but admire an architectural ensemble built up by the Arabs and completely made over by the Christians during the Middle Ages, under the command of Sancho Ramirez. This ensemble was built in different stages, with reforms, extensions and revamps which altered its mainly late Gothic style with Romanesque, Mudejar, Renaissance or Baroque remnants scattered around. On your way back from the collegiate church, take the street on your left and after 4 minutes you’ll find the viewpoint “O Vicon” which has some splendid views of the gorge of river Vero. 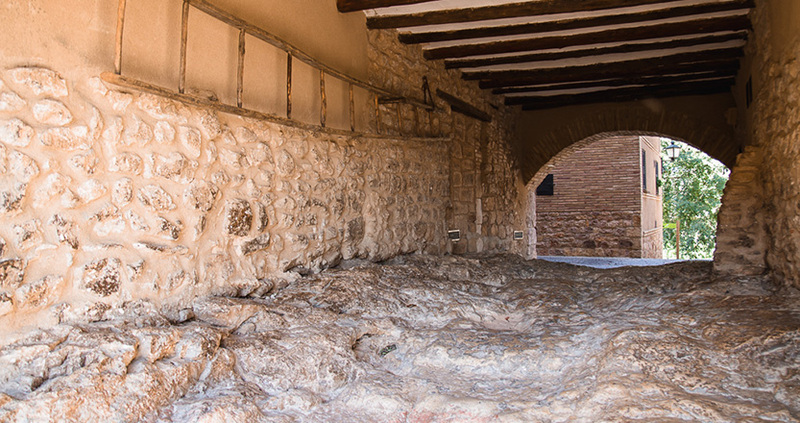 From here, we’ll head towards Baja St where you can find the “Casa Fabian” museum, where you’ll learn about the local ways and customs in Alquezar. MUSEUM OPENING TIMES: 11.30 -14.00 AND 17.00 – 20.00. ENTRANCE FEE: €2 (FREE FOR KIDS UNDER 6). CLOSED ONE DAY A WEEK – PLEASE ASK ON TEL. (+34) 974 318 913 and 669 405 777. Once we’re done with our visit, we’ll most likely be eager to give the local gastronomy a try. 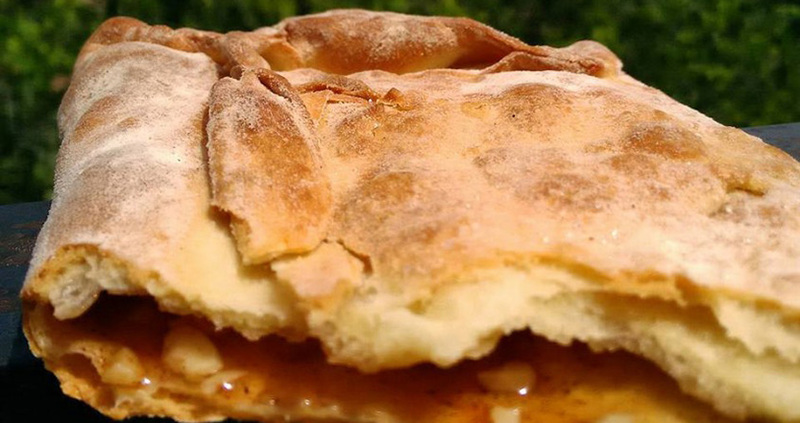 There are many options and the regional gastronomic wealth can be savoured in different restaurants in Alquezar. We’ve elaborated a selection of some of the best ones, in our opinion, based on their experience and good service. The traditional local dish is ‘ternasco de Aragon’ a delicious roasted lamb, but you’ll polish off any dish you order… they’re just so good! To better digest our meals we’ll pick up our route where we left it off. We’ll discover some alleyways with traditional houses showing their front framework and where peace and quiet are still much present. Baja St, Serrato arcade or Medio St are just some of them. Despite the reduced size of Alquezar, getting lost in its streets is usually a rewarding experience… just remember to use Albarrana tower as a reference and the river Vero canyon as a natural boundary. This route can be done in two hours if you don’t have time to spare, but we suggest taking it easy and enjoying the experience. If you come in summer, you can bring along some swimwear and spend the afternoon beating the heat in the crystal clear natural pools along river Vero. Our starting point will be Rafael Ayerbe square, the crossroads of the main streets in the village. The route has two separate entries, one of them in Iglesia St, opposite the town hall, and the other one in San Lucas St – taking the first footpath on your right, this one leads you to the monumental Barranco fountain which dates back to the 16th century. From this point, you’ll access a majestic landscape with ravines and gorges fitted with mountain walkways with splendid views over the river Vero. 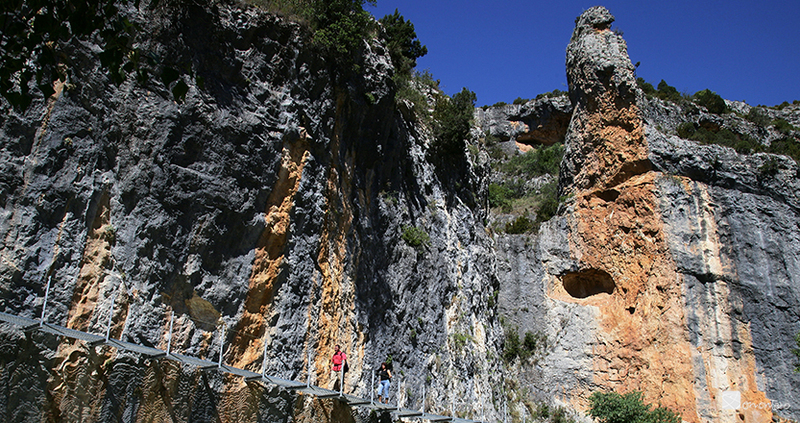 Along the route you’ll notice very peculiar geological formations and plant species – some of the latter are protected species with a high ecological value. The panoramic views over the gorge and the prospect of a swim in the turquoise waters are the main assets of this sensational route. WE SUGGEST THAT YOU WEAR MOUNTAIN FOOTWEAR, A HELMET, AND TAKE WATER AND FOOD WITH YOU. PLEASE TRY TO AVOID RAINY OR SNOWY DAYS AND THE HOTTEST HOURS OF THE DAY IN SUMMER, IF POSSIBLE. IF YOU SUFFER FROM VERTIGO OR ARE VISITING WITH KIDS UNDER THE AGE OF 5 THAT ARE NOT USED TO HIKING, PLEASE ABSTAIN FROM THIS ROUTE. 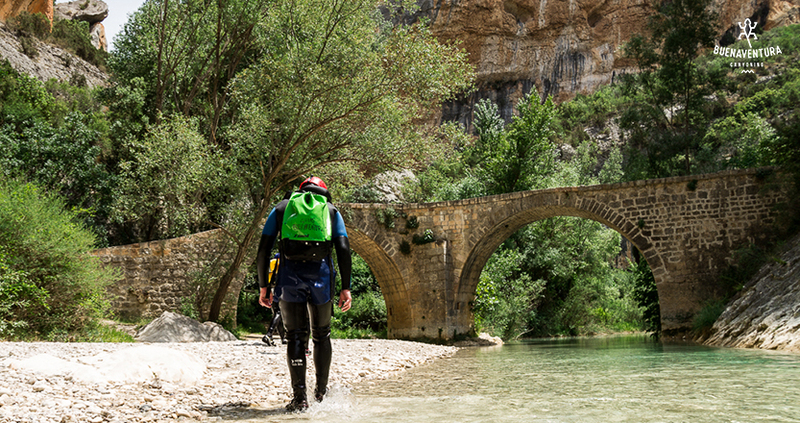 Likewise, if you enjoyed the experience, we recommend coming another day to practice some canyoning down the river Vero, one of the most scenic ones in the province of Huesca. 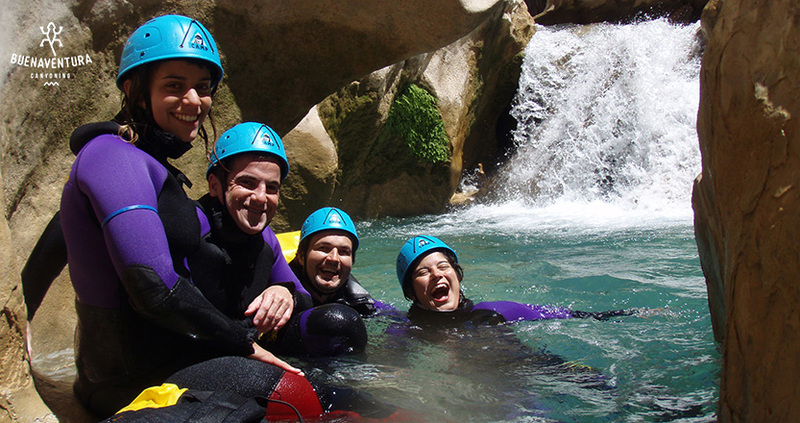 Every year, thousands of visitors who come to Alquezar looking forward to trying their hand at canyoning are pleasantly surprised to discover this cute little village. As you may have realized, Alquezar can be easily visited on foot, although you need a car if you want to go to some other interesting places in the area, such as the village of Lecina with its millennial tree, the rock art-containing rock shelters of Colungo, the wineries of the Somontano appellation, and the canyon of river Mascun close to Rodellar. These are just a selection of formidable places that are well worth a visit. 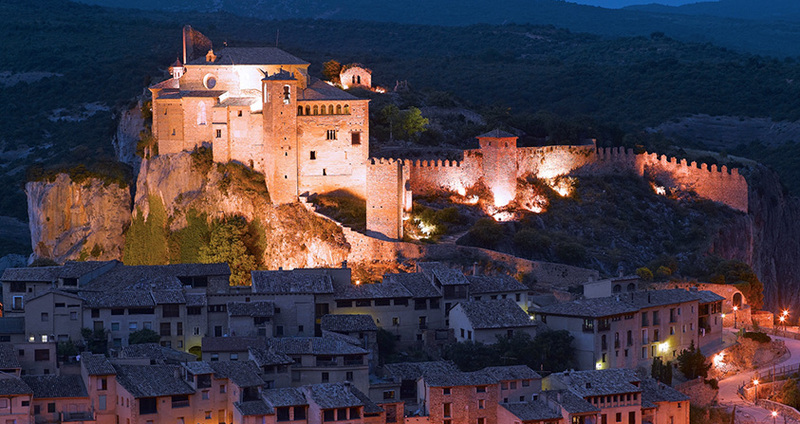 To round off the day, we suggest you go to the ‘Wind Smile’ lookout again, gaze at the tastefully illuminated collegiate-castle under a starry sky… and start planning your next escape to Alquezar!